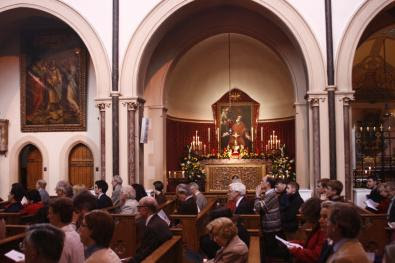 We have already shown you some photos from the London Oratory, and one of our readers sent notice of the following photos of St. Philip's Day from the Oxford Oratory, where Mass was celebrated by His Excellency Archbishop Antonio Mennini, Apostolic Nuncio to Great Britain. VATICAN CITY, 31 MAY 2011 (VIS) - On the occasion of the 100th anniversary of the Pontifical Institute of Sacred Music, the Holy Father sent a letter to Cardinal Zenon Grocholewski, chancellor of the institution. The letter, which was published today, was read at the institute last Thursday, 26 May. Benedict XVI recalled that Pope St. Pius X founded the Higher School of Sacred Music, which two decades later was elevated by Pius XI to a pontifical institute. The Holy Father stated that, in order to clearly understand the identity and mission of that Institute, it was necessary to know that St. Pius X founded it "eight years after having issued the Motu Proprio 'Tra le sollecitudini' on 22 November 1903, with which he brought about a profound reform in the area of sacred music, turning to the great tradition of the Church against the influence exercised by profane music, above all of the operatic type". This magisterial intervention, in order to be implemented in the universal Church, needed a center of studies and teaching that would faithfully and appropriately transmit the directives indicated by the Supreme Pontiff according to the authentic and glorious tradition that dates back to St. Gregory the Great. In the span of the last 100 years, this Institution has assimilated, developed, and expressed the doctrinal and pastoral teaching of the pontifical documents, as well as those of Vatican Council II, concerning sacred music, to illumine and guide the work of composers, chapel maestros, liturgists, musicians, and all instructors in this field". The glorious feast of Pentecost is coming, and that also means another glorious event: The Chartres pilgrimage. Here is a video produced by a French television station KTO which one of the FSSP priests on Facebook recently pointed us to. If any of our readers will be going and would like to help contribute toward our coverage, please send us a note. 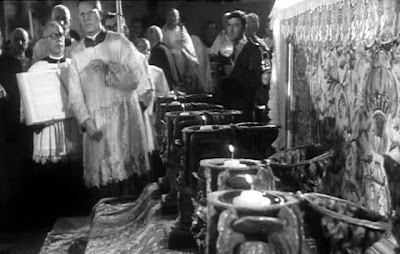 Occasionally, people ask if there is a "proper" order in which to light the candles on the altar. Some insisting that there is only one way to do this. They usually say that the "correct" way to do this is to light the six major candles starting from the middle and moving first toward the right or "Epistle" side, then return to the middle and light from the center to the left or "Gospel" side. In snuffing the candles, the order is reversed. So they tell us, "The Gospel candle never burns alone." In fact, this practice belongs to the Roman Rite, although some Dominican provinces, such as the American Eastern Province adopted it. 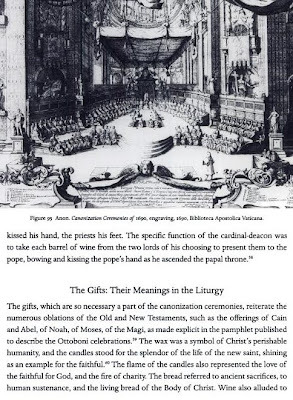 But in the traditional Dominican Rite a different order was normally used and continued to be used, even after the adoption of the New Rite of Roman Mass by the Order in 1970. This order for lighting is not specified in any official ritual book of the order, which simply tell the number of candles and when to light them. Fr. 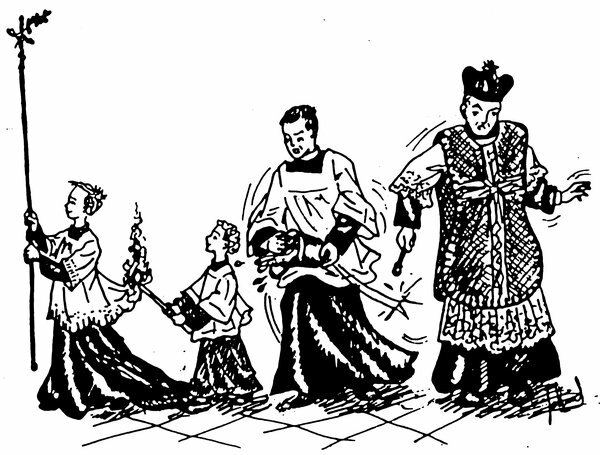 Bonniwell, in this Dominican Altar Boys' Manual and his Dominican Ceremonial for Mass and Benediction, both products of the Eastern Province, simply gives the Roman way. But historically there was another way. In the Dominican way, the candle on the far Gospel side is lighted first, then each candle in order across the altar to the Epistle side. They are snuffed in the opposite order. Thus the "Gospel Candle" burns first and longest, very suitable as the Gospel is the "Light of the World." You can see an acolyte at our Western Dominican Province House of Studies in about 1958 in the photo to the right. He is lighting the candles in the Dominican fashion: starting from the left he has already lighted the first candle and is lighting the second. You can tell that the feast was either a Double or Full Double (in the language of 1962 a First or Second Class Feast) because the acolyte is wearing alb, amice, and cinture: the Dominican Rite practice on major feasts. The Dominican books do give explicit instructions on the number of candles to be used at Mass. This rubric is a beautiful example of the Dominican love of "progressive solemnity." The rule (Caeremoniale S.O.P. nn. 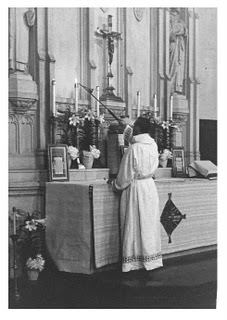 514-17) is: Six candles for solemn feasts at Mass, Matins, and Vespers, but four candles at Compline; Four Candles for mid-ranked feasts at Mass and Office, but only two at Compline; and finally, two candles at Mass and Office on ferias and lesser feasts, and the same two at Compline. Private Masses always have just two candles, no matter what the level of the feast. A similar ranking governs the number of "Sanctus Candles" that are lighted from the Sanctus until the Purification of the vessels. These are placed in single, double, or triple branched candlesticks flanking the altar: three candles on each side on major feasts, two on each side on mid-ranked feasts, and one on each side on ferias and minor feasts. One candle, on the Epistle side, is used at Private Mass. Another interesting practice was not to fill the altar gradines up with multiple candles sticks f or different numbers of candles. Rather the six large candle sticks were the only ones used, and only the number of candles needed were lighted. Which ones to light was dependent on which candles had burned the lowest and were shortest. In the flanking photograph you can see Fr. Hilary John Martin, O.P., now professor emeritus at our Dominican School of Philosophy and Theology saying the conventual Low Mass during Passiontide in 1954. You can tell it is Passiontide because of the statue veils and the lack of an antependium. Two altar candles are lighted as is proper for a feria -- and notice that they are the two tallest ones and so need to burn down to match the others. You can see the Epistle side "Sanctus Candle" (lighted, so this is after the Sanctus); the Gospel side "Sanctus Candle" cannot be seen in this photo. The server properly wears the surplice (under his capuce since he is not ordained) since this is a public Mass. 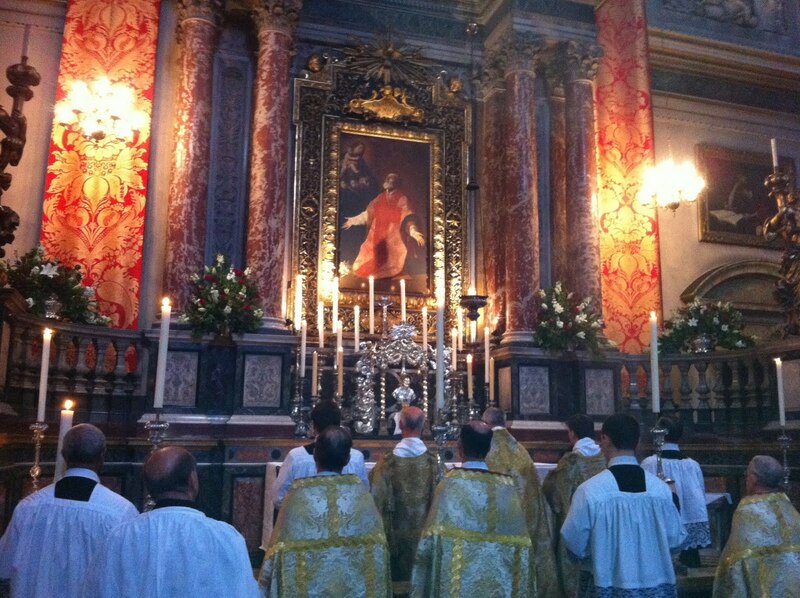 Were this a Private Mass, he would be wearing the cappa (the black cape that is part of our habit). I thank Bro. Raymond Bertheaux, O.P., a cooperator brother of our province with over 50 years of service, for help with this posting. Those who have been involved in serving at the altar for any length of time are likely to understand and appreciate the humour. "The cérémoniaire must always be prepared to react!" 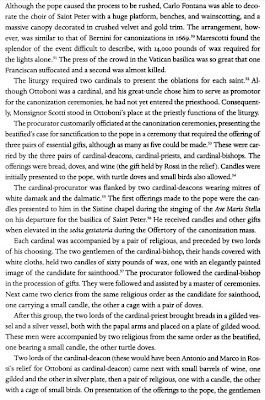 "Sunday congestion at the door of the sacristy." "An accident is always possible." The tradition of the art of caricature, the editorial cartoon and the like is something which I think should be explored further within our own particular context -- by which I mean not only Catholic printed journals but also the digital medium, including blogs. These have a certain charm, humour, and can also provide powerful commentary in some instances -- indeed, they are sometimes more powerful than words. In point of fact this is a possibility I have explored for this site in the past and it is one I am still interested in. Accordingly, if we have any artists who would like to consider submissions to the NLM for possible publication, based around themes pertinent to the NLM, I would certainly be very interested to receive those proposals, or to simply discuss the matter further. The first four speakers at the conference; from left to right, Bishop Schneider, Bishop Aillet, Cardinal Canizares and Cardinal Koch. Photo courtesy of Orbis Catholicus. The first speaker was His Eminence Antonio Cardinal Canizares-Llovera, Prefect of the Congregation for Divine Worship and the Discipline of the Sacraments, who spoke on “The Sacred Liturgy as the Life of the Church.” In the well-known words of the Second Vatican Council’s very first decree, Sacrosanctum Concilium, the liturgy must be at the center of the Church’s life, its source and summit. According to the Cardinal, the post-conciliar liturgical reform brought certain advantages, such as the more active and fruitful participation of the faithful, and an enriched use of scriptural texts, but also saw “deformations of the liturgy at the limits of the tolerable,” (and indeed, we might add, beyond tolerable,) citing the words of the Pope himself in the letter to the Bishops that accompanied the 2007 motu proprio. 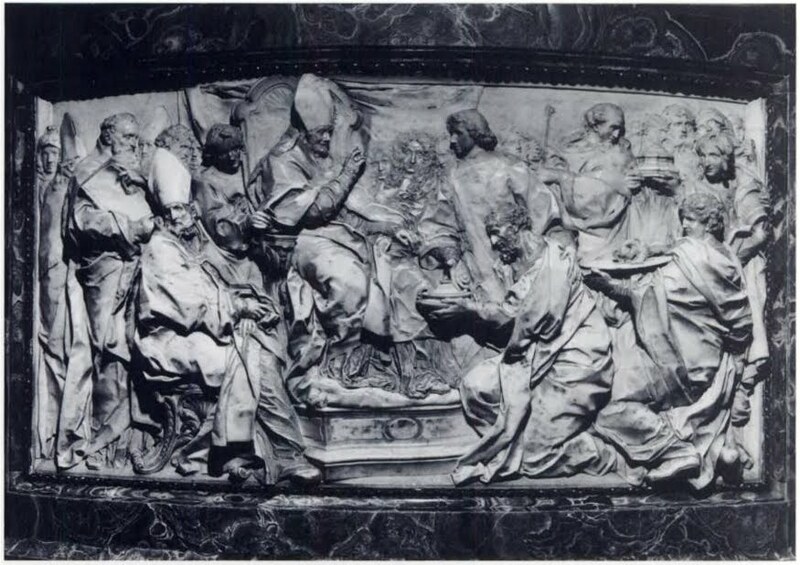 The Cardinal also insisted very strongly on the relationship between the motu proprio and a correct “hermeneutic of continuity of the Council.” The two forms of the Roman Rite are not in conflict with each other; each shares in the unity of the church, even though some of the post-conciliar reforms have gone far beyond the letter of Sacrosanctum Concilium. As he sees it, the current problem of the liturgy and of future reform lies not in the particular form of the liturgy itself, but in its sense and spirit; the Church needs to return to the true sense of Sacrosanctum Concilium and the original liturgical movement. Quoting a Muslim who said that if Christians really believed in the Real Presence, they would prostrate themselves before it, His Excellency noted that this is hardly practicable, and prostrations are used for other things in the Latin Church, such as the ordination rites. However, a return to the reception of communion kneeling and on the tongue, already seen in the Papal Mass, would be a good step to restoring greater reverence for the True Presence of Christ in the Sacrament. He concludes by citing the words of the Pope again, written before his election, that at some point in the future, the Church must return to having a single rite, but one more firmly anchored in tradition. The third speaker was Kurt Cardinal Koch, the recently named President of the Pontifical Council for the Unity of Christians, formerly bishop of Basel, Switzerland; His Eminence spoke on “The Ancient Liturgy of the Church, an Ecumenical Bridge.” Rejecting the idea that the broad permission for use of the older form of the Roman Rite is in some way an attack on the ecumenism of the post-conciliar period, he ascribed such an idea to a series of falsely construed oppositions. Thus, for example, the Sacrificial aspect of the Eucharist should not be set against the idea of the Eucharist as a Sacred Banquet in commemoration of the life of Christ; Sacrifice unites the Eucharist and Eucharistic piety to the sacrificial life of Christ Himself. The unification of thanksgiving and sacrifice is not a medieval relic, but a necessary part of the liturgy, richly expressed by the traditional Roman Canon; His Eminence very rightly suggested that the Roman Canon needs to be put to greater use in the Ordinary Form of the Roman Rite. 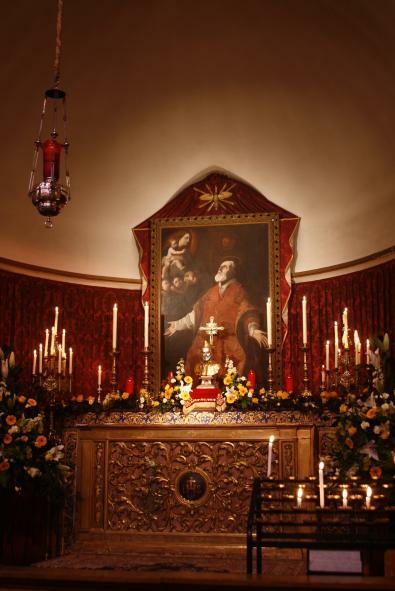 Likewise, the widespread rejection of Eucharistic Adoration on “ecumenical” grounds after the Council is entirely contrary to the tradition of the Fathers. Eucharistic Adoration should be seen as a prophetic foreshadowing of the heavenly liturgy described in the Apocalypse; in Heaven, Sacrifice and Consecration will cease, but Adoration will not. The Cardinal described the recovery of Tradition as a way towards renewed understanding with other Christian confessions. For example, celebration towards God, or, as detractors of the practice say, with the priest’s back to the people, is a very ancient Christian liturgical tradition, in which all the faithful and clergy turn together towards the Lord. Practices of this sort are common not only to other Christian denominations, but to many other religions; turning the altars was not foreseen or supposed by the Council. The priest facing the people does not “show respect for the(m)” in any meaningful way: when the Cardinal said that “no-one complains that the driver of a bus is looking at the street and has his back turned towards the passengers!”, the lecture hall exploded with applause. He began by noting how from the very earliest times, the threefold Christian hierarchy of bishop, priest and deacon was compared to the threefold Jewish hierarchy of the high priest, priest and levite. Such a comparison is frequently made in the traditional rites of ordination, and deacons are called levites already by Pope Clement I in the first century. The deacon’s role in the liturgy is one of the service to the priest, and this role is proper to his office, and not to the faithful as a whole. 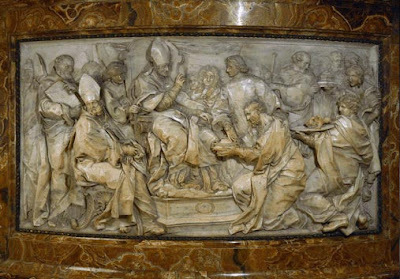 In ancient times, there were very few deacons, (Rome itself had only seven at any given time), who fulfilled only the most important roles; from the second century on, the Church began to associate other “orders” with the diaconate, the subdiaconate, the lectorate etc. These roles were always called “orders” until the 1972 decree Ministeria quaedam, in which the proper roles of the minor orders were attributed to the common priesthood of the faithful, and hence, the remaining two minor orders, now called “munera" (duties), opened to women. His Excellency noted that in Rome, women still do not serve in Papal liturgies, but outside Rome, women have in fact acted as servers in Papal liturgies, even though this is in theory prohibited by the Code of Canon Law. In the kingdom of Christ, there can be no race or contest for “power” in the act of Divine Worship; all must be filled with a spirit of humility and self-denial. His Excellency concluding by stating that we should ask the grace from God that the Holy Father issue a motu proprio to restore the minor orders in accord with the traditional discipline still maintained by the oriental Churches. (This statement was followed by thunderous applause.) 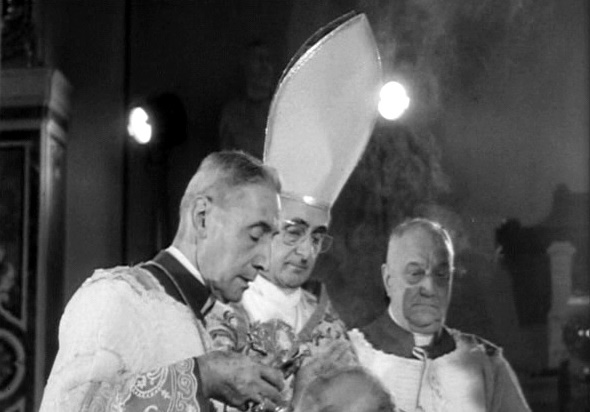 No council, and certainly not Vatican II, ever asked for the abolition of the minor orders, or for any change to their arrangement or nature. Such a motu proprio would be a necessary compliment to Summorum Pontificum, a gift to the Church, and an enhancement of the sacred character of the liturgy. A small part of the crowd in attendance at the conference in the Aula Minor of the Angelicum. Photo courtesy of Orbis Catholicus. 27. Rogationes, id est Lætanias, ante Ascensionem Domini ab omnibus ecclesiis placuit celebrari, ita ut præmissum triduanum jejunium in Dominicæ Ascensionis festivitate solvatur; per quod triduum servi et ancillæ ab omni opere relaxentur, quo magis plebs universa conveniat. Quo triduo omnis abstineant et quadraginsimalibus cibis utantur. 27. It seemed good that the Rogation, that is to say the Litanies, are to be celebrated by all churches before the Ascension of the Lord, that during these three days the maids & servants are exempt from any work, so that the more people meet in full. During these three days, may everyone do abstinence and use food of Lent. 28. Clerici vero qui ad hoc opus sanctum adesse contemserint, secundum arbitrium episcopi ecclesiæ suscipiant disciplinam. 28. As for clerics who would scorn to be present at this sacred ceremony, they undergo an ecclesiastical penalty to the discretion of the bishop. Note the equivalence established by the Council of Orleans between the two terms Rogation and Litanies. These prayers of request (rogare: to ask) have taken the form of litanies since the advent of these processions in Gaul. Certainly, as evidenced by the medieval manuscripts and printed editions of processionals, psalms and antiphons were also sung in France during these processions, but the heart of the prayers used to beg God for our necessities and which struck the popular mind most were the litanies. The same semantic equivalence has persisted from 511 A.D. to our own time in the Roman rite - which has had the Rogation days since the time of Pope St. Leo III († 816) -- for here they are also referred to as the Lesser Litanies. In the Roman liturgy, the liturgical form of the processions of the Lesser Litanies is exactly the same as that which takes place on April 25 for the feast of St. Mark, the Greater Litanies, instituted by St. Gregory the Great. In France, however, various dioceses in their own ancient liturgical books used a wide variety of specific pieces for these three Rogation days instead: psalms, stations, antiphons, responsories, but also many different litanies; generally, all pieces changed on each of the three days. 1. The oldest type are the diaconal litanies which are close to litanies of the Byzantine liturgy, found also in the litanies of the Ambrosian rite during Lent. In Gaul, this is represented mainly by the litany said "of St. Martin", which is probably the oldest. This litany starts with V/. Dicamus omnes. R/. Domine miserere. V/. Ex toto corde, and ex tota mente, adoramus te. R/. Domine miserere , etc... At each invocation, the people respond "Kyrie eleison" or "Domine miserere." These litanies do not invoke the saints, but beg God for various practical needs. They are the most venerable part of the French liturgical repertoire, dating from the time of the antique rite of Gaul, and they survived in some French dioceses until the nineteenth century. 2. A second type of litany in use in France in the Middle Ages was quite similar to the litany of the saints that we know today in the Roman rite. After the initial Kyrie and invocations to the three divine Persons, the Virgin Mary and the saints are invoked. Often, these litanies do not include the invocations the Roman rite added after the list of saints. We could compare these litanies of saints to similar invocations to the saints found within Byzantine Compline. It is likely that this kind of litany goes back to the Carolingian period. 3. A third type appears to have originally been in favour in the South of France but, thanks to the neo-Gallican liturgical reformists of the seventeenth and eighteenth centuries, they knew a great revival of interest and were widely diffused. Invocations to the saints are mixed with short supplications to God. The archetype is the litany Aufer a nobis that the musicologist Amedee Gastoué described as an antique litany from Narbonese Gaul, and which has been often reprinted during the twentieth century (this litany Aufer a nobis is used in Paris for the third day, as we will see below). It is likely that this type is a form which comes from the Mozarabic liturgy, which was synthesized in Gaul with the Litany of the Saints of the aforementioned type. The use of Paris in the Middle Ages sang many antiphons, verses, collects and litanies of the saints according to the second type for the rogation days. Thus, according to this Parisian Missal from the thirteenth century (folio 251 V°) in its rogation litany, Paris invoked the Holy Trinity, the Blessed Virgin Mary, the three main Archangels, St. John the Baptist, the Apostles and Evangelists, 91 Martyrs, 51 Confessors and 41 Virgins. After a forced Romanization of their rite in the early seventeenth century, Parisian liturgists of the seventeenth and eighteenth century sought out in the ancient traditions of the Churches of France what should be honoured; they assigned to the three rogation days three litanies of ancient tradition coming from the South of France. These litanies belong to the third type listed above, and thus are a hybrid of the Mozarabic invocations and the Carolingian litanies of the saints. Office de l'Eglise noté pour les festes et dimanches, à l'usage des Laïcs, par ordre de Monseigneur l'Archevêque. IVème partie, le Temps paschal, Paris, Libraires associés, 1760. Pages 67-72, 78-79 and 86-88. Here is how the rogation were organized in Paris: an initial procession would go from one church to another (from the church of the collecta to the church of the statio), accompanied by the singing of the Gradual psalms with prolix antiphons. At the stational church, the Mass is sung and then the procession would proceed back to the first church with the singing of the litany. All is ended by the singing of the antiphon of the saint to whom is the church is dedicated, with their verse and collect. (It is also the common usage that when the procession stops at a chapel or a church, the antiphon, verse and collect of its owner are always sung). Nowadays at St. Eugene, we of course sing the rogation days according to the Roman rite, with the Litany of the Saints before the Mass. However, at the end of the Mass, when the procession returns to the sacristy, we used to sing these ancient litanies, which are not without musical beauty (far from it), and which recall the historic diversity of expression of the Faith in our country. Here are these three curious litanies. Please click on the images to get more complete ones. 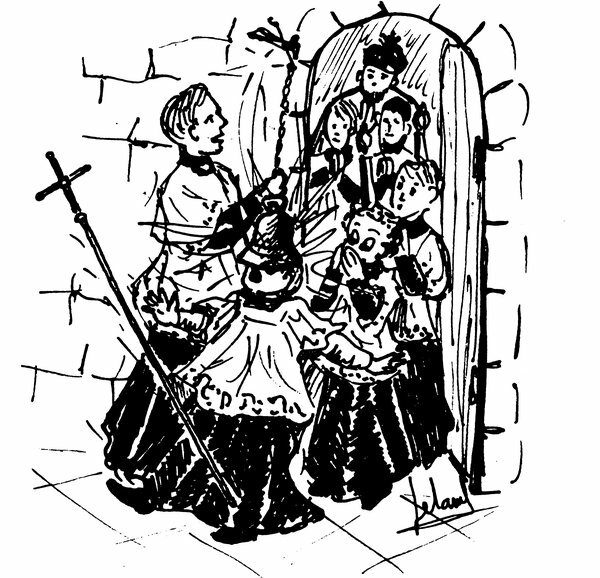 - Litanies are conceived as a dialogue between two children (or two clerics) and the choir. - When the rubrics mention "cadence", this is the way Parisians cantors indicated -- since the Middle Ages -- that they have finished singing and that the choir is about to. This is reflected by changing the last notes of the melody (the process is known, according to the case, as perielesis or diaptosis). Please compare, for example, the Christe audi nos of the children and that of the choir in the first litany. - According to the oldest usage, the vertical bars here are not to indicate the breathing of the singers but rather the distinction of the words -- breathing should be inferred from the punctuation. The debate about Vatican II, rupture and continuity continues on Chiesa with a monk of the Abbey of Le Barroux, Dom Basile Valuet, OSB, weighing into the discussion. In recent weeks, www.chiesa has given voice to a very lively discussion on the acceptance or rejection of this criterion. A discussion born from the "disappointment" of some traditional thinkers over the way in which Benedict XVI insists on defending en bloc Vatican Council II, which in their judgment should instead be corrected where it has "broken" with the Tradition of the Church. The following is a new contribution to the discussion. It is by Dom Basile Valuet, a Benedictine theologian of the abbey of Le Barroux, in France, between Provence and the Alps. 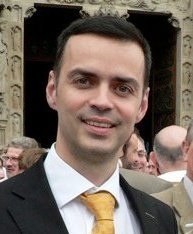 Dom Basile is the author of the monumental six volume work, La liberté religieuse et la Tradition catholique (éditions Sainte-Madeleine, 1998). When depicting Christ or Our Lady one always has to consider their individual characterics (handed down to us by tradition); but at the same time the artist will always consider modifying the appearance so that those who are likely to see the painting will identify with Him or her. 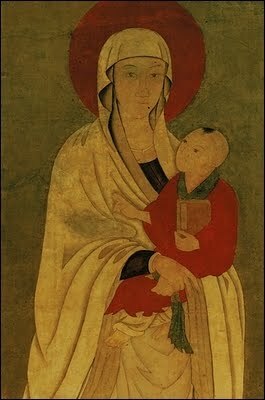 Here are some paintings by Chinese Christians. The first, left, dates from the 14th century and the second from the turn of the last century. Christ is the Everyman, the model for all humanity. When He (or indeed Our Lady and the saints) are painted, the image must also participate in a model of humanity that the audience can relate to. All sacred art is a balance of the general and the particular. 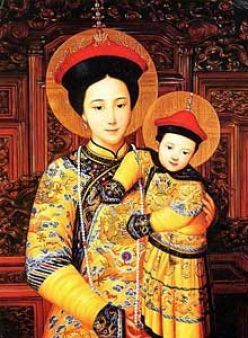 If those who are going to see the painting are going to be almost exclusively Chinese, then it is a legitimate approach, I would argue, to portray Christ and Our Lady as Chinese. While we are in the Far East, some New Liturgical Movement readers will remember Shawn Tribe featuring Japanese Madonnas painted by Carmelites. This principle is used famously, in a different way, in the Isenheim altarpiece painted in the early 16th century in the gothic style by the German artist Matthias Grunewald. 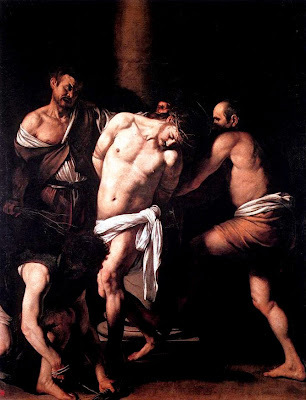 Christ is horribly disfigured, but not as he would have been disfigured by the passion. This painting was made for a hospital in which people were suffering from an illness caused by fungus in the rye grain used in the bread eaten locally. The cause was not known at the time and so the illness was incurable. The symptoms match exactly those that Christ has in the painting. This is clearly intended to offer solace to the patients to communicate to them that Christ is suffering with them and for them. There are many depictions of Christ by Western European artists that show him as Western European for the same reasons. 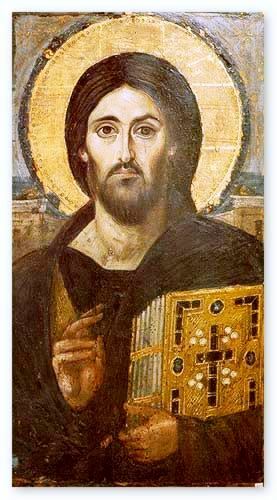 When I showed my students the Christ pantocrator, below, many assumed that this was painted in Western Europe too, and were surprised to learn that it was from Mt Sinai in Egypt. I could only offer a speculation as to why his skin tone is paler than one would expect of a working man, a carpenter, in the Middle East, which would surely have been known to the Egytians who saw this image in the 6th century. I suggested that as this was in the iconographic form, the artist would shown the uncreated, heavenly light emanating from the person of Christ. So the lightening of the skin tone is linked, perhaps, along with the other familiar features such as the halo to the depiction of this. Seeing Christ as a source of light, the Light of the World, would apply also to baroque art, although more subtly applied. Even if my suggestion is correct. It doesn’t apply universally. The last two are from Russia. So in this case the skin tone reflects neither the uncreated light, nor that of those who are likely to see the icon. 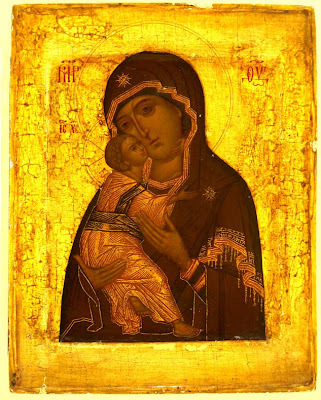 I once had lessons from an icon painter in England who had been at one time a student of the famous Russian iconographer, Ouspensky. She told me to use predominantly the green-brown colour that we see there (called ‘avana ochre’) with highlights used sparingly in yellow ochre and white specifically because it matched the olive-brown Mediterranean complexion. It seems that an artist has a choice in these matters. The governing principle is that he should aim to maximize his chances of communicating the person of Christ to those who are likely to see his work. Recently, some objects appeared on John Sonnen's blog from the Vatican's Museo Storico (Historical Museum), where apparently not even the employees know quite what they are. 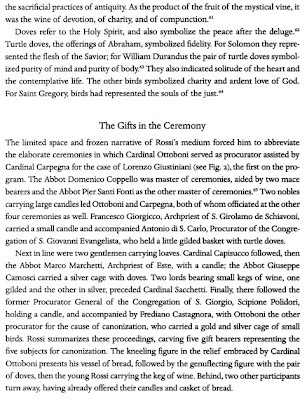 These objects were used in the traditional Rite of Canonisation, where gifts of bread, wine and doves were offered to the Pontiff. 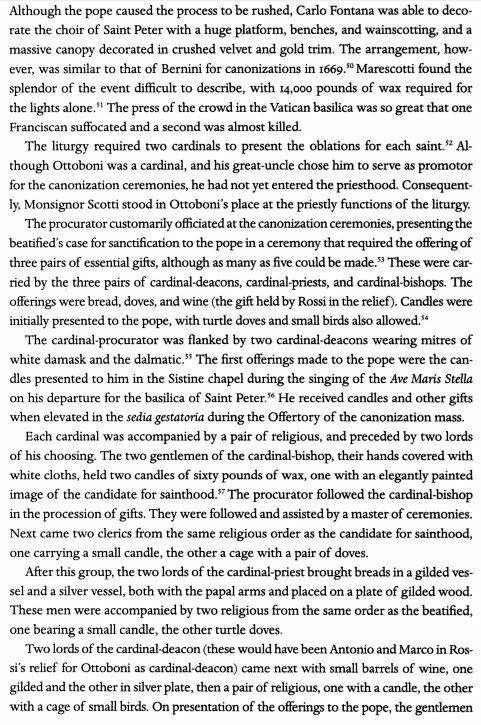 The Saints canonised on that occasion were Sts. 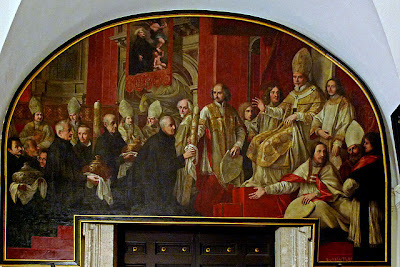 John of God, Paschal Baylon, Lawrence Justiniani, John a S. Facundo, and John of Capistrano, all of which are still celebrated in the calendar of the usus antiquior, but only two of them - St. John of God and St. John of Capistrano - remain in the Roman calendar of the newer form. I am pleased to announce a new addition to the NLM writing team, Henri Adam de Villiers. Henri resides in Paris, France where he is the master of the choir of Saint-Eugene-Sainte-Cecile -- a church we have featured here many times. Since 2010, Henri is likewise the master of the choir at the Russian Catholic Church in Paris in addition to his duties at St-Eugene. Henri is the editor of the French blog, Liturgia.com, which is also known by the name, Schola Sainte Cecile. He has studied political, economics, literature, music and theology and is presently a teacher at a Parisian school of business. Henri is interested in the liturgical music of both the Christian East and West, Gallican liturgical uses and comparative liturgics. 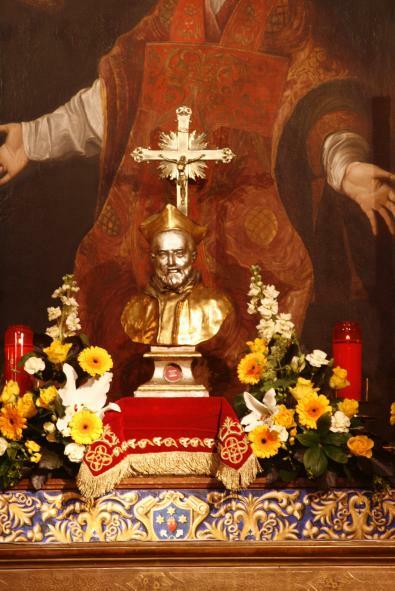 Just a few more photos of the festal decorations at the altar of St. Philip Neri, the London Oratory, for the feast of their founder today. Seeing these very festive photos (kindly provided at our request by one of the members of the London Oratory -- thank you) put me to mind of an article I wrote here in October 2008, wherein I tied into Josef Pieper's work on festivals and festivities, In Tune with the World: A Theory of Festivity. In this piece I considered the importance of marking and keeping festivals -- and with great festivity at that -- and made some proposals. Rather than simply pointing you to the piece, I will re-post it here, below today's images from the London Oratory, which offer some glimpses into their own "keeping of the feast." The German Catholic philosopher, Josef Pieper (1904-1997) might not seem strictly liturgical at first glance, but many of his works, particularly those upon leisure and festivity as viewed through a classical and Catholic conception, have a great deal to offer those interested in the liturgy. Historically as well, it is an interesting footnote that it was by means of a lecture by Romano Guardini on Goethe, Thomas Aquinas and the classical spirit that the plan of Pieper's first work, Reality and the Good (Die Wirklichkeit und das Gute) was born. We have focused upon Pieper here before in the past and today I wished to turn our attention to a wonderful little book by Pieper, In Tune with the World: A Theory of Festivity. Now festivity is something which one can hopefully immediately understand as having some liturgical connection. After all, we refer to our special days and periods of the liturgical year as "feast" days; days of festival. 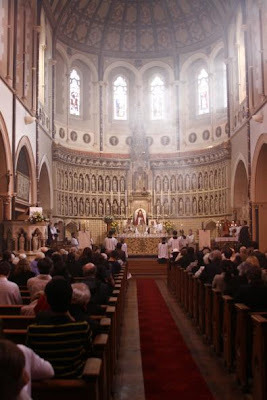 Of course, what this might mean has arguably become lost in many places as, liturgically, these days often come and go without a great deal of difference in the solemnity and festive nature of the liturgy itself, let alone in society generally or in the domestic church that is one's home. Indeed, in many places, but for a time like Easter or Christmas when this sense is still retained on all of these levels -- though sometimes, as in the case of Christmas, prematurely -- it is almost as though it is too much bother, even for our parishes. On a cultural level, these times of festival and "holiday" (holy-day) have typically become secularized and distorted. One can of course think again upon Christmas which has become quite material, commercial and secular, and is prematurely celebrated (again, no doubt for commercial reasons, but then, when the real substance of the liturgical feast is lost, the gap must be filled). Another example would be St. Patrick's Day which, formerly a day of festive rejoicing by the Irish for the "apostle" to their people, has devolved into a general time of drunken behavior and disturbingly coloured ales -- and I, of course, refer not to the "black pint", but rather to the green one. Pieper argues that the real nature of festivity is fundamentally tied to God and to contemplation. Celebrating a festival then is to become contemplative and directly confront the higher realities upon which the whole of human existence rests. Pieper argues that true festivity always involves the divine, for festivals don't arise from mere ideas, legislation or political decisions. For the Christian, just as for Plato, festivals are something divinely established, having their roots in the rituals of worship. In fact, Plato calls festivals a "holy time" and ties them to ritual worship -- a definition that was likewise accepted by Cicero and the ancient Romans as well. It is true that we might fix calendar days or the particular activities associated with these days -- so there is human invovlement on that level -- but, he argues, we cannot make or invent what is to be celebrated -- and if we try, it is bound to fail. True festivals allow us to move beyond the present, liberating us through an awareness of a greater reality which in turn gives us a broader perspective upon the day to day. So it is that an inability to be festive signifies an imprisonment in the present, whereas in celebrating festivals in a truly festive way, we move beyond the barriers of this present life on Earth. Ultimately, Pieper refers us to the liturgy of the Church, and particularly the Mass, which likewise moves us beyond what is immediately present and into deeper realities. 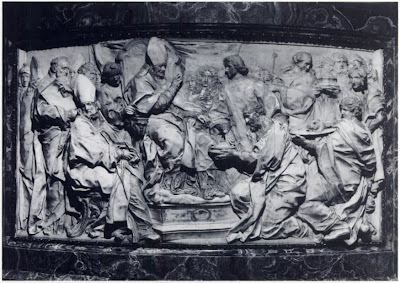 Ritual (or liturgical) festivity is, Pieper argues, the greatest form of festivity, and as has been noted already, all truly festal times are rooted in the divine and in ritual praise. 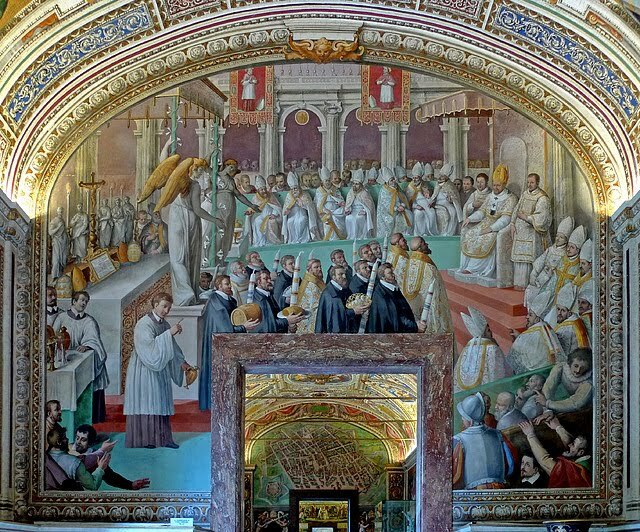 This is a very brief and rudimentary synopsis of some of Pieper's arguments, no doubt not giving them the depth of focus they deserve, nor perhaps doing them justice, but the main point here is not to consider Pieper's specific argument as it is to consider Feast days within the cycle of the liturgical year. What spurred on this consideration of feast days was an image sent to me some while ago coming from Malta. When I saw it, what immediately came to mind was that here seemed to be a Catholic people that had retained the fullest sense of keeping the Catholic festival in a way that not only permeated the churches in their festal decoration and in their liturgical solemnity, but which also flowed out from the churches and her liturgy into the streets themselves. The liturgical year of the Church establishes a pattern of feast days and festal times, and it seems to me that in many places -- particularly in North America and parts of Europe -- our ability to "keep the feast" has been eroded. Evidently, how we keep the Feast will depend on a variety of circumstances. Malta has the advantage of being one of the most Catholic countries in the world. Still, it seems to me that whether we are looking at the broader culture or whether we are looking at our parish culture, our Feast days should be acknowledged and celebrated more than just as a mark on the calendar, a mention in the opening prayer of the Mass, or even as the theme of a homily. These are all good things as well of course but we need to reach beyond intellectual and into to existential. These are the things that can permeate into a culture and into the one's life and the lives of one's children. It seems to me the place to start is within our liturgies, our parishes and our homes. With regard to our liturgies and parishes, we should consider how we make the liturgies of feast days particularly punctuated by solemnity. For joyous feast days, it has been a tradition to decorate the church. Traditionally, one of the great exemplars of church decoration for feasts was found in the red wall hangings used for festal occasions. This is obviously a very involved method that will not be feasible for every parish, but perhaps there are other ways. Certainly the tasteful and restrained use of proper flower arrangement in the church will be of help. Simpler forms of tasteful hangings may also be do-able and cost-feasible where a more ornate form of this is not yet possible -- though certainly it seems to be something worth striving towards. Parish priests should consider at least using altar frontals on these festal days in the proper liturgical colours if they do not use them generally. 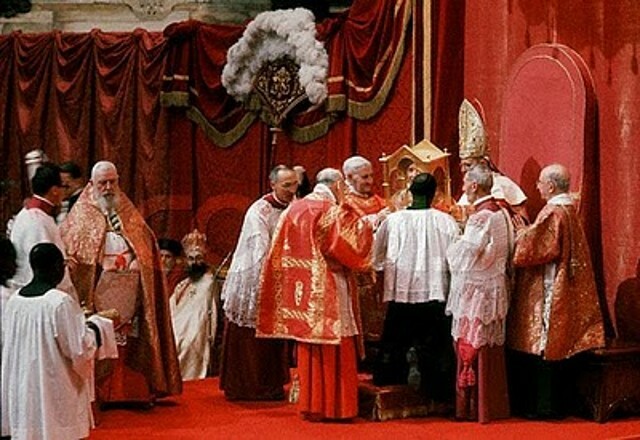 If they do use them generally (which is to be preferred in my opinion), then consider investing in more solemn forms of them for the liturgical colours of red and gold -- which are the liturgical colours you will typically find will likely call for the distinction between a typical liturgical day and a particularly festal one. Likewise, it was formerly more common to see more ornate forms of vestments for these days. Again, consider making that investment. 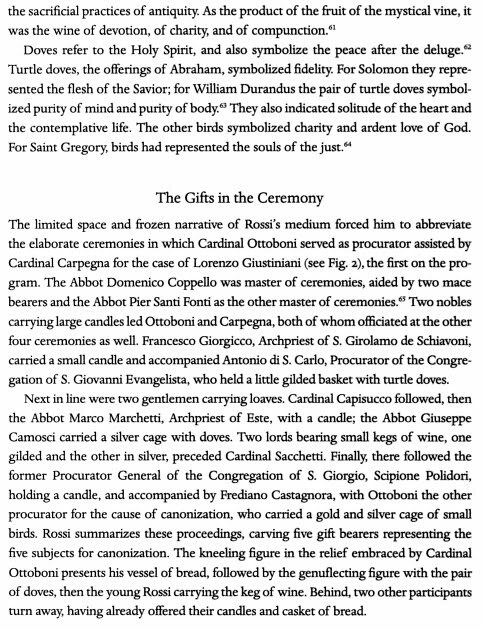 Certainly it seems that the vestments of the priest and the altar (i.e. the frontal) are amongst the two most important priorities in reclaiming these festal aspects of our liturgical and ecclesial life if we understand the liturgy as being central to the observance of the feast. 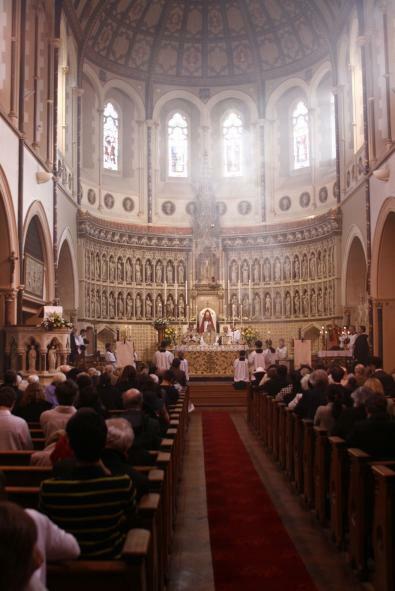 In the same way, feast days are most certainly a pertinent time to invest the liturgy with the splendour of a polyphonic Mass setting, particularly in places where this is difficult to accomplish on a Sunday to Sunday basis. This too should be a priority. One way to begin to bring feast days outside the literal walls of the parish and back into a more public milieu is to re-establish the Catholic tradition of outdoor parish processions. This will further punctuate the difference of the feast day from the everyday. As for the home, families are the domestic church and these days would be particularly appropriate to mark in our homes as well, establishing family traditions around them. For example, on All Souls Day one could make a tradition of visiting the cemetery to pray for the deceased members of one's family or the deceased generally. On joyous festal days, one could have a particularly special family meal to mark the day, perhaps similar to what one is accustomed to doing at Christmas or Easter, with the various trimmings that make the event noticeably special. These things mark the day and further make an impression and are the material of memories that will be carried by children into their adult years and possibly passed on to their own children. By doing all of these things in the home and the parish then, we not only begin to mark our feast days with greater festivity, we also put ourselves on the path to re-establishing a Catholic culture -- a culture that has arguably been eroded not only in many Western societies, but even in many Western parishes. Let us re-learn how to keep our Catholic festival days. By way of the Ordinariate Portal, I ran into the following interview with Cardinal Donald Wuerl on the Anglican Ordinariate and its development and establishment within the United States. If you prefer, you may listen to the audio version of the interview. 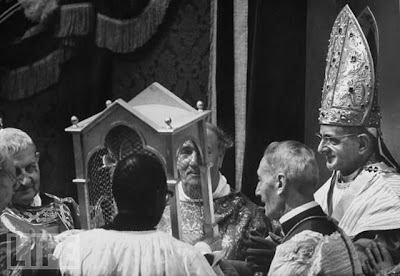 I happened across these images of Pope Paul VI reconsecrating the great Benedictine Abbey of Monte Cassino on October 24th, 1964 on the blog Sacris Solemniis. 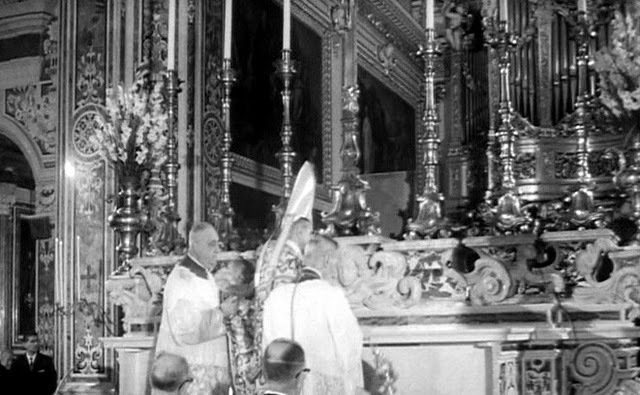 While we are on this topic of archival footage, efootage.com has numerous other short clips involving papal liturgy and ceremonial -- some of them rather rare. 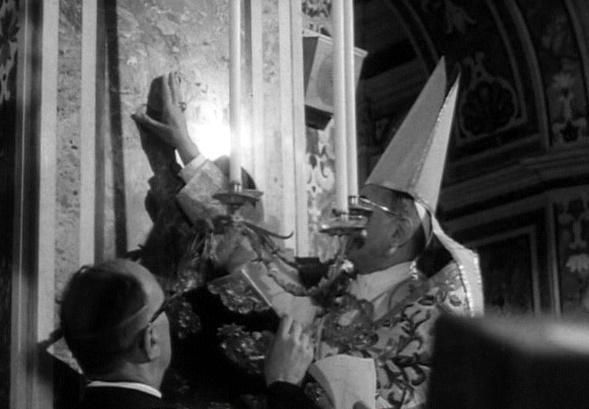 As well, we have video footage showing Funeral rites in St. Peter's Basilica. Further, while we are accustomed to seeing blessings from the balcony of St. Peter's, something you don't see every day is a papal blessing from Santa Maria Maggiore: Pope Pius XI Blesses the World. Today, we celebrate the feast of St. Philip Neri, "the apostle of Rome" and founder of the Oratorians. While we are hopeful to bring you more photos, here is one coming from the Facebook page of the London Oratory, showing First Vespers of the feast from the same. Before the altar of St. Philip Neri. Note the red festal hangings. I would like to thank all the readers who forwarded or posted suggestions for the final version of the pew booklet "The Dominican Rite Mass," which is now available in final format for ordering at Dominican Liturgy Publications. 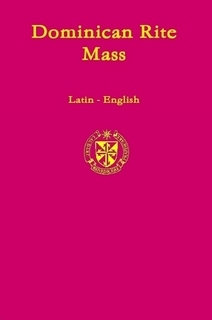 This booklet presents the Ordinary of the Mass in Latin and English on facing pages and is suitable for use by people attending Dominican Rite Mass. It also includes music for High Mass and devotional prayers.